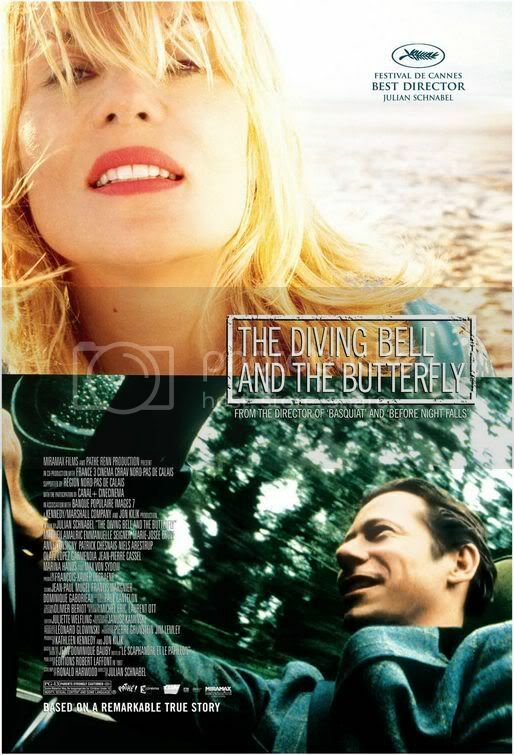 Julian Schnabel’s background in art shines vividly through every frame of The Diving Bell and the Butterfly. Taking the acclaimed book of a vastly interesting character and situation, he paints the picture not only visually, but technically and architecturally as well. Almost ninety percent of the film is shown through the eye of Jean-Do (Mathieu Amalric), an esteemed editor of Elle magazine. 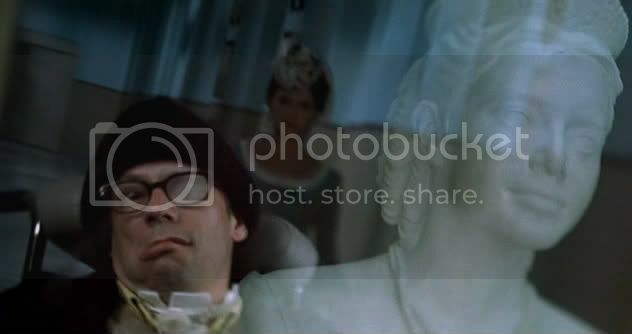 As the film opens he has already suffered his massive stroke; he is paralyzed from the bottom of his feet to the top of his head. He is fully conscious and aware, able to hear and observe and remember. But he cannot talk, he cannot move his head, he cannot move. All he can do is open and close his left eye. Jean-Do has locked-in syndrome, a rare but devastating trauma reminiscent of the fate suffered by Joe Bonham in Dalton Trumbo’s Johnny Got His Gun. His former life, his loved ones and family, and his work and play-mates replay themselves in his mind, but he can no longer have new, meaningful experiences. At first Jean-Do is rather obstinate, willing to check out and give up. With the help of a determined speech language pathologist, Henriette (Marie-Josée Croze), he discovers that there may be hope if he is patient and willing to learn. Henriette devises an original system of communication that involves her reading the French alphabet one letter at a time. When she arrives at the letter he wants, he blinks. She repeats the alphabet, he blinks. And so he can write, one letter at a time. That Jean-Do, in real life, was able to write the book on which the movie is based is a remarkable achievement. But Jean-Do does not really think of it as remarkable. He finds a way of expressing himself, communicating once again with the world. In doing so he rediscovers the small things that comprise his most cherished memories and learns how he has not always been an admirable man. He never married the mother (Emmanuelle Seigner) of his children, preferring instead to chase models and whatever other gorgeous French women came his way. He learns to appreciate, if not fully agree with, those who have faith in spiritual things. Throughout the film the camera is locked in to a singular viewpoint, much like Jean-Do has only one means of observing the world. This may seem gimmicky and boring but Schnabel does a remarkable job making it fluid and essential to the story. There are flashbacks when Jean-Do relives certain memories, but much of the time is spent as he lived his final days: gazing directly ahead, wherever his caretaker pointed him. There are benefits to this type of existence, as a multitude of beautiful French women take turns gazing deeply into the camera. At first his return glaze is lascivious, eager to recapture the lustful ambitions of his healthier years. He eventually begins to refocus his attentions, paying closer heed to how he has previously lived his life and what he will do with his remaining time. But there is no half-hearted redemption story involved. There is no single cathartic moment in which he repents for all his sins and finds the truth. Instead he examines and considers his life, his wrong-doings, and the moments that brought him great joy. In this way the film is closer to much of Ingmar Bergman’s work than it is many of today’s dramatic efforts. Throughout the process Schnabel manages to construct an artful, meditative film. Never does his style come off as indulgently avant-garde. It genuinely and carefully reflects the way Jean-Do views the world. A scene in which a dancing butterfly floats across many of Jean-Do’s greatest memories is riveting. Even seemingly-random shots of icebergs breaking into the sea are utterly transfixing, all the more so as they run backwards over the end credits. Jean-Do’s story, on its own, is inspiring and incredible. To be filmed with such grace and beauty is a treat and a pleasure. At the same time, the camera doesn’t shy away from displaying Jean-Do’s deterioration. His body and face are not lovely to look upon, but a subtle voice-over helps underline the incredible tension and frustration, and ultimately a measure of redemption, that he experiences. The Diving Bell and the Butterfly is a work of art, employing mature themes and a delicate camera to effectively portray an amazing story. This entry was posted in 3 pirate flags, 4 stars, D, Movie Reviews, Pirate Flag Rating, Star Rating on April 7, 2010 by Tim Irwin.